Why Does Gravity Wave, And Why Does It Matter? 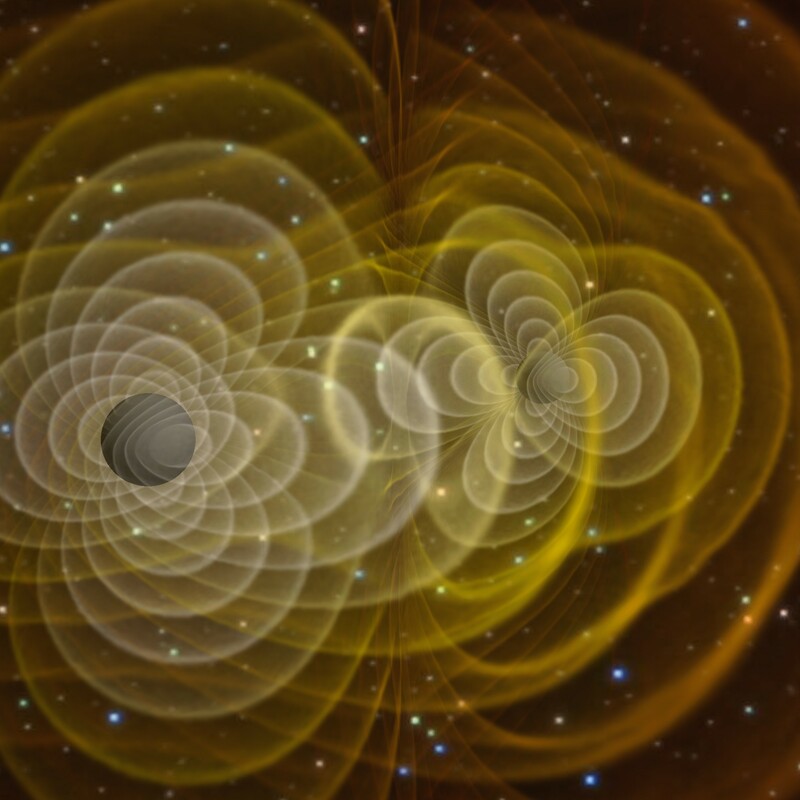 LIGO announced that they have detected gravitational waves from a black hole merger. If verified it will be the ultimate confirmation of Einstein’s theory of general relativity. But what are gravitational waves, and why is their detection such a big deal? Water is perhaps the most common example of a wave. Drop a stone into a calm pond and you can see ripples expand over the surface of the water. This occurs because water is a fluid. When the stone is dropped into the water, it pushes the water around it out of the way. The water closest to the stone is pushed into the surrounding water, causing it to bunch up a bit. As the bunched up water tries to go back to its original state, it pushes into water further out. Thus a ripple moves through the water. This is the basic process of any wave. A disturbance in a material affects the region around it causing the disturbance to move through the material. Thus we have ripples in water, sound waves in air, and even seismic waves from earthquakes. Since it takes time for the disturbance to move through the material, waves move through the material at a finite speed. For a long time it was thought that waves could only move through a physical material, like sound through air. When it was shown in the 1600s that light travels at a finite speed, it sparked much debate over whether light was made of “particles” as Newton suggested, or whether it was a wave traveling through some material. 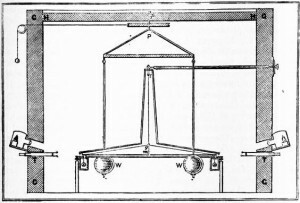 In the early 1800s experiments showing light’s wave behavior seemed to answer the question in favor of waves. We now know light’s behavior is more subtle than that, but in the 1800s it seemed clear that light was definitely a wave. So there must be a material through which light propagates. 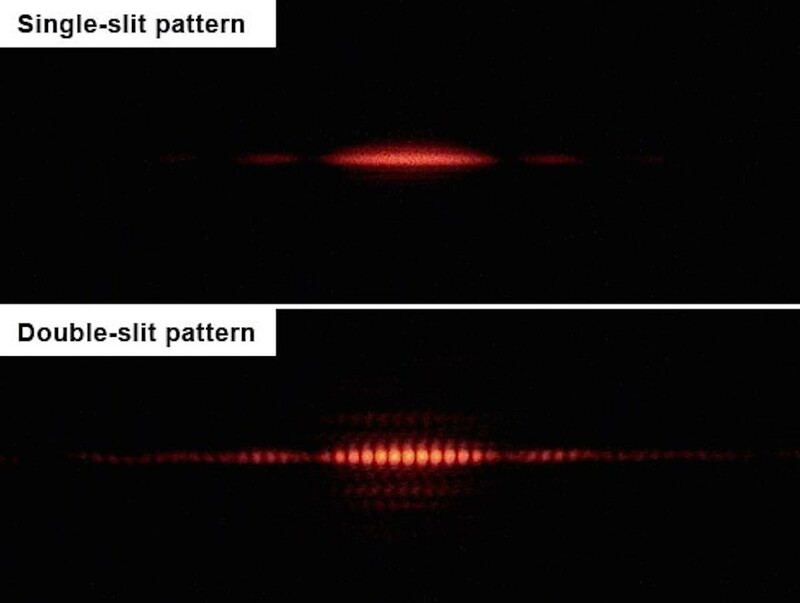 Light passing through two small slits creates an interference pattern, proving the wave behavior of light. Credit: Wikipedia user Jordgette. The most popular candidate was known as the luminiferous aether. The difficulty with the aether was that it would have to be completely invisible and insubstantial to physical objects, so there was no way to detect it directly. The only evidence that the aether existed came from the fact that light travels in waves. Odd as the aether was, it clearly had to exist since waves always move through some material. Then in the late 1800s it was found that the speed of light was always the same regardless of ones motion through the aether. This is a deeply un-wavelike behavior. 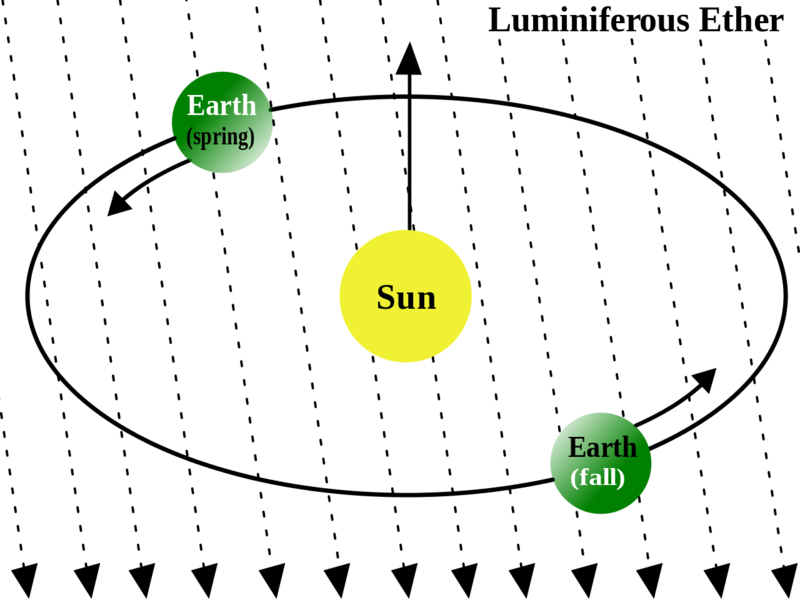 If light really moved through the aether at a particular speed, the Earth’s motion through the aether should make the speed of light appear faster or slower at different times of the year. An unchanging speed of light meant our assumption about the aether must be wrong. In the early 1900s it was shown that light waves could be explained through special relativity. Instead of moving through a material, the energy fields of electricity and magnetism could be disturbed like a fluid. Light waves are thus waves of electromagnetic energy moving through space. Because physical objects are made of charged particles that have electromagnetic fields, this meant they could never travel through space faster than the speed of light. Relativity showed us that waves didn’t need a physical material to travel through. Waves could move through fields of energy. But if physical objects couldn’t move faster than light, what about gravity? In Newton’s model of gravity, masses exert forces on each other instantly. As a result, energy could pass from one mass to another with infinite speed. It seemed odd that light energy could only travel at the speed of light while gravitational energy could travel instantly. This puzzle led Einstein to develop a general theory of relativity. The basic idea of special relativity is that no frame of reference can be favored over any other. This allows the speed of light to be the same in all frames of reference, but it does so by making the behavior of space and time relative to the observer rather than an absolute background. Even the concept of “now” is relative. In general relativity the central idea is the principle of equivalence. Since all bodies fall at the same rate regardless of their mass, a body floating freely in space must be equivalent to a body falling freely. As a result, gravity is not a force between masses, but rather an effect of spacetime curvature. 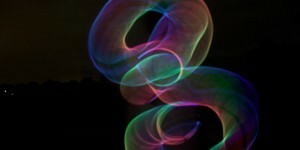 Under Eisntein’s model space and time become flexible and relative, and take on a fluid-like behavior. Masses moving through space should create disturbances in spacetime, just as running your hand through water creates ripples. If general relativity is correct, then there must be gravitational waves. Over the years various tests of general relativity have confirmed the theory works, and so it has widely assumed that gravitational waves exist. But observing gravitational waves directly has been notoriously difficult. Even the strongest of gravitational waves would be extraordinarily weak, and since they are a warping of spacetime itself, effects such as the finite speed of gravity are impossible to measure. The best evidence we’ve had so far has been indirect evidence. In the 1970s observations of a pulsar orbiting another star found that it slowly spirals closer to its companion. According to relativity this is because gravitational waves radiate away from the binary system, causing it to lose energy and spiral closer together. But without a direct observation of gravitational waves, there is the chance that general relativity could be wrong. We could, for example, come up with a model that gives us all the effects of Einstein’s theory without gravitational waves. It wouldn’t be as elegant as general relativity, but it would work. Gravitational waves are an absolute necessity for general relativity, and if they don’t exist the model is wrong. So even though we expect gravitational waves to exist, without proof there would always be a small bit of doubt about relativity. That’s why we’ve been looking for gravitational waves for so long, and that’s why the result is so important. Equivalent in what way? Can someone offer a succinct explanation? Thanks! It’s the founding idea of general relativity. Thx. I’ll give your post a careful read! Where h is Planck’s constant, c is the speed of light, ν is the frequency, and λ is the wavelength. Of what form would be the expression for the energy of gravitational waves? It’s not nearly as simple since gravitational waves are in general nonlinear, but you can see derivations of linear equations here. Many thanks for this link. The author does a remarkable job of dealing with rather arcane subject matter. Could we use Ligo as a Michelson interferometer? Dark matter is suspected to influence gravitation in the universe and light is curved in space-time. As we now have detected gravity waves in a very small dimension is there still any chance the aether does exist only at these very small dimensions? I’ve always been a medium-minded person when it comes to light though all experiments so far have yet to show it. Now that we have a sensitive-enough interferometer will those experiments be run again? Basically LIGO is a Michelson interferometer. LIGO detected gravitational waves using an apparatus which was capable measuring very small units of length. Would LIGO be useful as a more accurate Michelson interferometer to better test the wave nature of light at these small dimensions? Not to diminish the importance of the recent LIGO detection, but you don’t really need General Relativity to have gravitational waves. Without GR, if you were to accelerate a mass, a kink would be produced in the gravitational field lines, and this kink would be propagated through space: a gravitational wave is born. In Newtonian gravity forces are instantaneous, so there would be no waves. You can’t simply treat gravity like an electromagnetic field. Folks have tried and if doesn’t agree with experiments. Right. But as you point out, with SR the field change would not be instantaneous. The point is that in a universe without GR, but with gravity, it is possible to have gravitational waves. All you need is gravitational fields with mass sources and finite propagation. Yes, GR would have to be replaced with something else, but nature is not only queerer than we suppose…. The observation of gravitational waves is not per se a demonstration of GR, albeit a magnificent achievement with loads of promise.